Welcome to the 13th edition of my (normally fortnightly) BullCharts software Tip Sheets, focussing on tips and hints regarding the Australian BullCharts charting software package. I have been very busy over the last few weeks with a couple of things. I have totally revamped my web site to make it much easier to navigate. With the special panel of useful links down the left-hand side (the navigation panel). I have sourced a good venue for my Hands-On Trading Workshop, in Vermont South, just off Burwood Highway, not far from the Vermont South Shopping Centre (in Melbourne's eastern suburbs). So I have scheduled another workshop for Thursday 21st May (this week!!). I only have a couple of seats left, so if you are interested you need to register quickly. See the "Workshops and Seminars" link on my Home Page. Session runs from 6:30pm to 9pm (ie. 2.5 hours). You can click here for more details. More Workshop details are included in the side bar on the right. A fantastic opportunity to try safe CFD trading on an overseas market in the early evening - and it's not your money. And the computers are set up like real trading workstations with dual monitors. It will be a great event. (BTW - I will soon be running BullCharts hands-on workshops at this same venue - stay tuned). I have also been busy preparing for my NEW and FREE seminar - "The 10 Key Lessons from the GFC" seminar (ie. the Global Financial Crisis). Everyone is welcome to attend, and you can bring your family and friends (but we are limited to 30 seats). It will be at The Leighoak Hotel (same venue as our BullCharts User Group meetings) on Wednesday 20th May (this week!!). See the "Workshops and Seminars" link on my Home Page. Session runs from 7pm to 8:30pm. Free hand-outs are available to those who register - so registration is necessary. You can click here for more details. 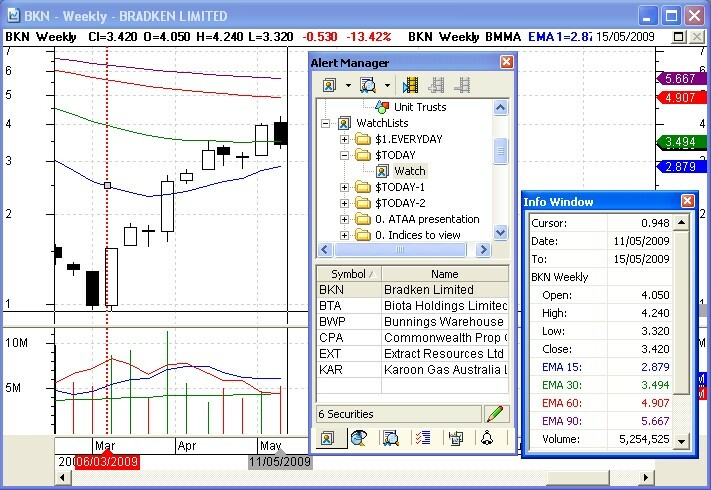 In this Tip Sheet below we look at a couple of things that are all demonstrated in the screen shot below (you can click on it for a larger image) - the Info Window, and an option in some of the BullCharts tools called "This tool is relevant to this security only" (in the screen shot below it is the vertical dotted red line). The first thing discussed below is a possible trading strategy, or at least selection criteria to look for stocks for purchase in the current market environment. I am always happy to receive feedback and suggestions for these Tip Sheets. Or if anything in a Tip Sheet is not clear, please feel free to contact me to ask about it (by email or phone). "This tool is relevant to this security only"
The biggest dilemma for all traders is the question: "which stock should I look at buying?". Okay, so how can you find a good stock to buy? Of course, this depends on your documented trading strategy. But conventional wisdom says that "the trend is your friend". That is, find a stock that is confirmed to be up-trending, and consider buying it. Okay, so how can we find up-trending stocks? One way is to take your preferred list of stocks which you will have in a watchlist. This might be either a watchlist that you have built up by adding stocks to the list over time. Or you might be content with watching the stocks in an index such as the S&P/ASX 200 (ie. the XJO - you can chart this in BullCharts just like any other security). Now, with your preferred list of stocks in a watchlist, you could view a chart of each stock once a week and look to see if it is in a confirmed uptrend. To help do this, you might put a couple of Moving Average indicators on the chart. The chart that you use to do this might look like the sample chart shown below, and described in the next section below. The chart below has a vertical line placed at the last significant low (6 March 2009 which might be our bear market bottom). You could step through the stocks in your watchlist, and view the chart to see which stock appears to be in a confirmed uptrend. But notice that the vertical line you placed on the chart might disappear when you switch stocks. You can force this line to remain displayed. This is explained below. Note that the vertical line that you can place on the chart might disappear when you switch securities; but might reappear when you go back to the original stock. If this happens, it will be because the IntelliCharts feature is turned on. The following notes refer to the displayed chart (click on it for a larger image). 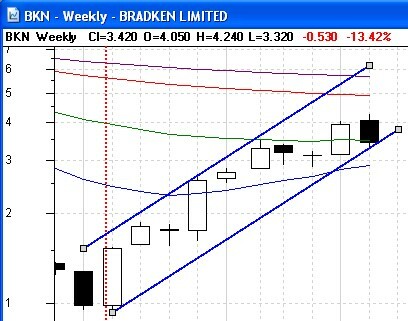 It is a Weekly chart of Bradken (BKN) from late February until today. The very top bar of any window is known as the "Title Bar", and in this example is coloured blue (using the Windows XP Classic colour scheme). The second row of this window is the BullCharts Pane Title Bar, and can be turned off if you don't want to see it. But it does show lots of useful information. In this example it shows the following few items. The security - BKN, and the time period - Weekly. Followed by the Close, Open, High and Low prices for the day (these might be shown further along this bar if you have changed the "Order" of displayed items - front to back, etc. The red text is the price change between the last two candles (in dollars and cents, and in percentage). Then information about the indicators is displayed (but only the first few characters can be displayed). You can change the sequence of some of the items along the Pane Title Bar as follows: right click on one element in the price chart (eg. a candle, or an indicator) and then choose "Order" from the drop-down menu, and click on one option (eg. "Bring to front"). The date of the latest day's data is in the top right hand corner "15/05/2009" at the right hand end of the Pane Title Bar. The red dotted vertical line is placed on the date of the last significant market low, which might be our bear market bottom (6 March 2009). The "Security Manager" panel is displayed, and is "floating" in the window (ie. it is "un-docked"). It shows my Watchlists, including several Watchlist folders, one of which is called "$TODAY" (I use a dollar sign to force it towards the top of the list in alphabetic order). This watchlist folder contains one watchlist called "Watch". The lower portion shows a list of stocks in this watchlist. The Cross-Hair cursor is enabled (you can toggle this on/off with a toolbar button). It appears as a fine vertical line and a fine horizontal line on the chart. The mouse cursor is where these two lines cross each other, and is positioned on 11/05/2009. The "Info Window" is displayed, and it shows the values of all candle and indicator elements for the date where the cursor is positioned. eg. "Cursor" = latest Close price; "Date" and "To" indicate the weekly range for the selected candle - because it is a weekly chart. The four coloured Moving Average indicator lines on the chart are my own indicator called "BMMA" (this is indicated in the Pane Title Bar). The Info Window shows these MA values as all EMA (ie. Exponential Moving Average), and with the four values: 15, 30, 60 and 90. The lower pane is Volume, with a couple of changes:- the Properties of the Volume are changed to show the Colour as: "Price change since previous", and there are three Moving Averages (Simple MA - 5, 10 and 50). Some of these items are described in more detail below. In the sample price chart above, you can force the vertical red dashed line to remain on the chart while you view different stocks. It is actually quite simple (but not obvious). Firstly, open a new price chart, and add a Vertical Line to the chart (using the Vertical Lines toolbar button - see the adjacent screen shot). 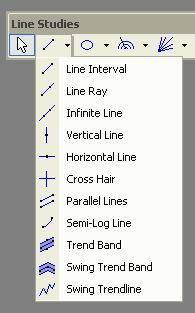 In the sample I have changed the Vertical Line Properties (on the "Style" tab): Colour = red; Style = a dotted line; and "Line Thickness" is a little thicker. Then on the "Advanced" tab there is one option called "This tool is relevant to this security only" - and I unticked the check box. It is that simple. Now when I step through the stocks in my watchlist, this vertical red line stays on the chart to mark the last significant market low. It is my reference point to look for the start of a new up trend. Question: "Okay, I think I have found an uptrend with some of my stocks in my watchlist using the method above. So, can I buy them now?" Well, this is where it is important to have your own trading strategy clearly defined and tested. The first step in stock selection is to identify a "possible" purchase. The next step is to search for "confirmation". This might be based on one or more indicators. Or perhaps on levels of Support and Resistance on the chart. Or maybe on Candle patterns. This is your choice, using a tested approach. You might also want to look at whether the stock is currently trading near the lows of its recent "Trading Range". If you can put a "Channel" around the price action of recent weeks, and if it is trading close to the highs of the channel, then it might be due for prices to come back down to the lower side of the channel. In the sample price chart above, a channel has been put around the price action, using the "Parallel Lines" toolbar button. If the price action is closer to the bottom line of the channel (as in the sample above), then the price might be due to rebound up, OR it might be about to fall down out of the channel. This all depends on your own back-tested trading strategy. NOTE: It can be argued that the channel placed on this sample chart is not a valid channel because the bottom line does not correctly indicate a rising trend, and so serves no purpose. But it illustrates the example. Or you can see a preview of each month's articles here. Good luck with your trading journey, and your increasing knowledge of the BullCharts software package. See the link at right for more details about the eNewsletter articles. A fantastic 2½ hour hands-on workshop session where you can really trade CFDs in the early evening on an overseas market. Find out what it is really like to trade CFDs - using signals on a 1-minute price chart. CFDs - what are they? How to go short (ie. sell them without owning them). How to read price charts. How to use Trading Plans and Strategies to improve your trading success. More details including information on how to register are on my web site. You can register at my secure outsourced OnLine Shop with credit card or PayPal, or print the registration form and send it in the mail (but if sending by mail, please ring me first to reserve a seat). The workshop venue is the Vermont South Community House with computers set-up like real Trading Workstations with dual-monitors.